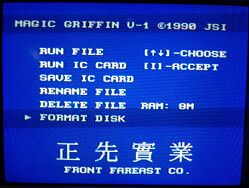 The Magic Griffin is a game copier. 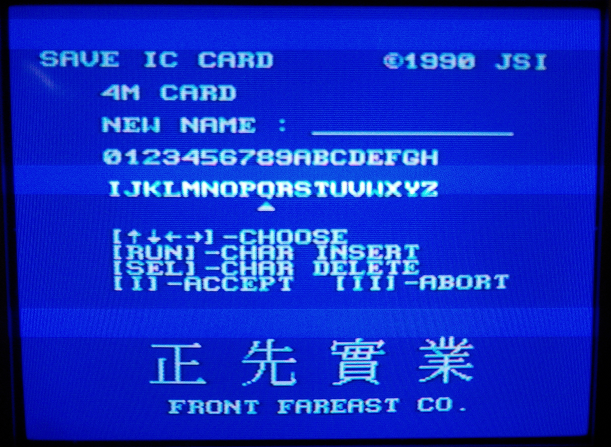 From the menu and the case, it seems to have been made by a taiwanese company called Front Fareast and JSI. I don't know if the Front Fareast listed on wikipedia is the same(link). And I've found nothing about JSI. About the hardware. You plug it in the Hucard slot and the joypad port. 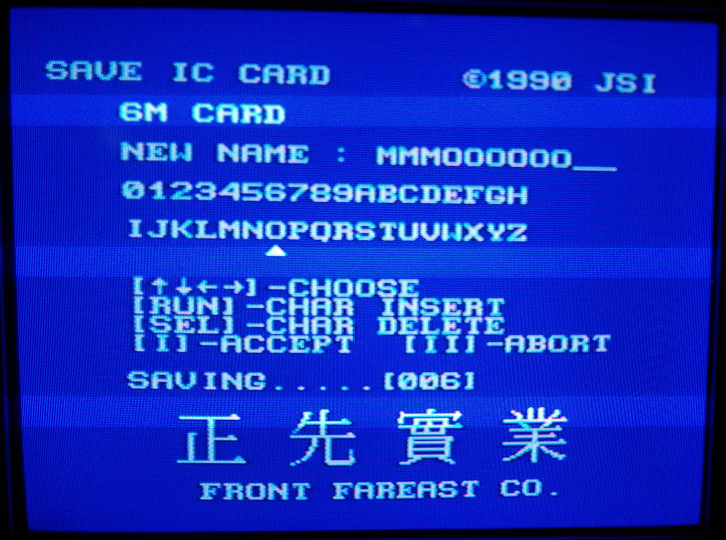 Oh I forgot, you can only use it on a PC Engine/CoreGrafx. 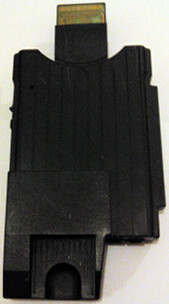 On the front you have a standard Hucard slot and 2 joypad ports. Only the right one is working. I don't know what's the left one is used for. 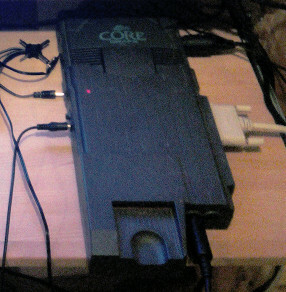 There are 2 parallel ports on the right. One for an external floppy disk drive and another one labeled COM port. I only tested the floppy disk. 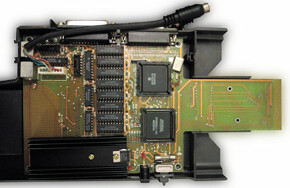 An Altera chip, a Motorola chip, some RAM, some TTL chips and a UV EEPROM (on the onther side). I haven't identified the chips yet. 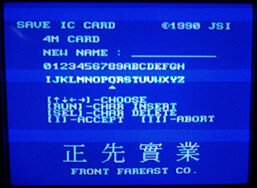 It may work like the other flash cards (TotoTek PCE Pro, Krizz Everdrive). This means that it acts like a standard Hucard. 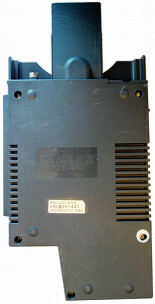 But some special addresses are used to communicate with the special hardware. For example the Everdrive can access the SD card via some addressess that are mapped to the SPI registers. I pretty sure the code is hosted on the UV EEPROM. 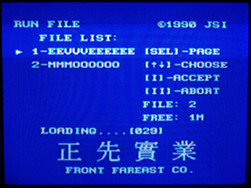 RUN FILE: Run a file from the floppy disk. RUN IC CARD: Run the Hucard. Unfortunately I was unable to run any card. It either tells me that there's no Hucard or it will freeze. 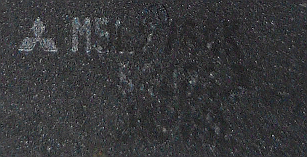 This surely comes from oxidized card connector. 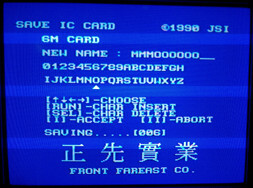 SAVE IC CARD: Save Hucard to floppy disk. As I said before I was unable to run any Hucard. Despite the fact that it seems to have dump the game, I was unable to run any of the game I've dumped. I'll check the dumped files as soon as I get my hands on an USB Floppy drive. But I'm pretty sure I'll have a bunch of 0xff. 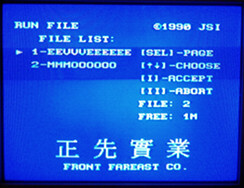 RENAME FILE: Rename one of the file on the floppy disk. 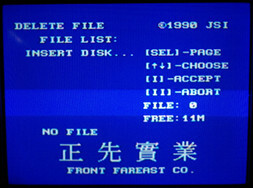 DELETE FILE: Delete a file from the floppy disk. 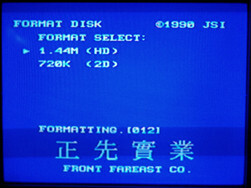 FORMAT DISK: Format floppy disk. 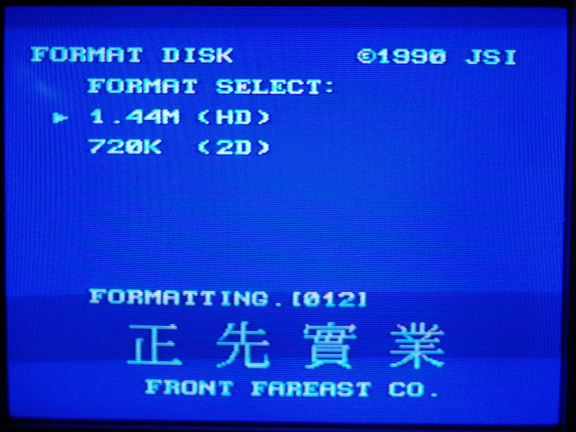 You can either format a HD (1.44M) or DD (720K) floppy drive. 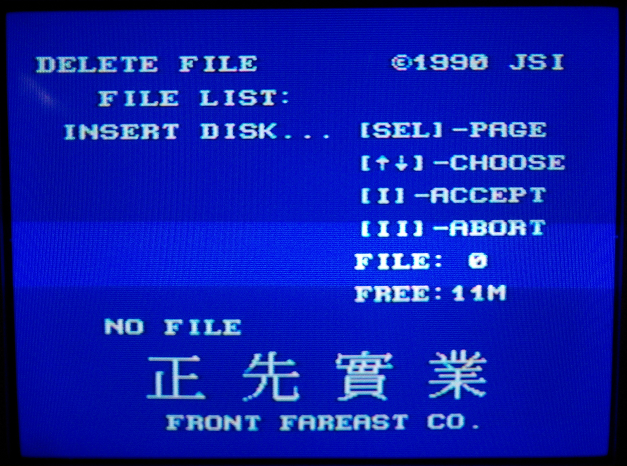 Be carefull, it'll start formatting the disk once you enter the menu. I'll try to clean/fix the connector. And once I receive the USB floppy drive I'll check the dumped files and verify which filesystem the disk was formatted. The coolest stuff will be to dump the UV EEPROM. So if someone knows how to safely read it, I'll be more than pleased to hear it. I fixed the connector. It's now working like a charm. 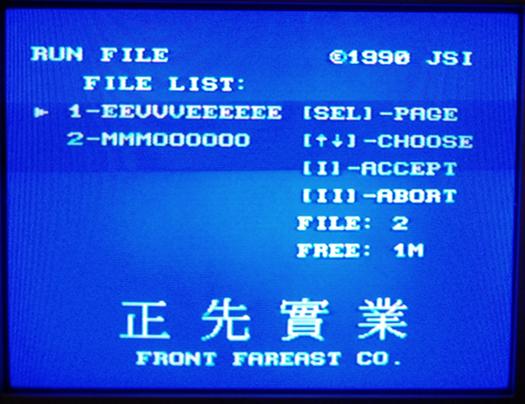 I managed to play games via RUN IC, save them to floppy and run the files. 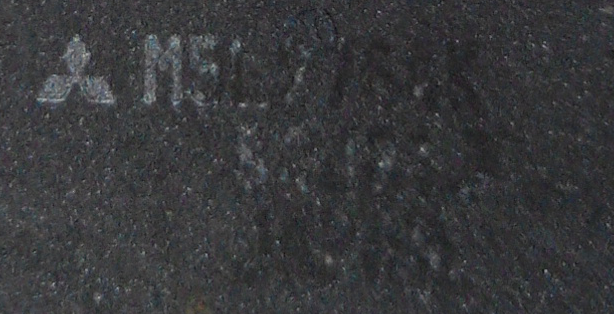 The UV EPROM label. I think it's a Mitsubishi M5L2764K. Redfield from the necstasy forum dumped the eprom. I'll post it tomorrow with disassembled source code. I started disassembling it. And there are some "funny" stuffs. There's only 1 IRQ defined (reset). And everything fits in 8K. I'll post the asm files later. ; switch HuC6280 to slow mode. ; $2a seems to hold a copy. ; No idea what it does. 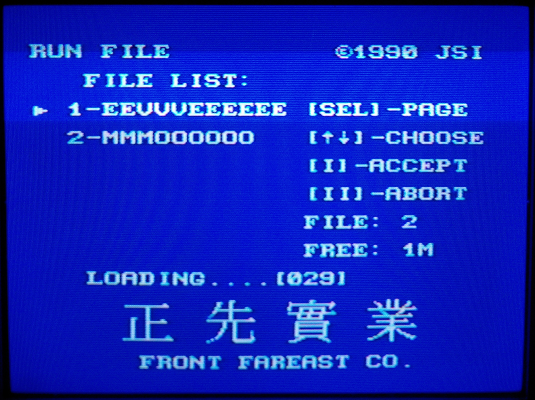 ; It's copying up to 1280 bytes. ; I have no idea what it's used for. ; To infinity and beyond! Well disassembling the whole stuff is, to say the least, boring. So let's use mednafen. It seems that the communication with the Motorola chip is done via $c000 to $c007. At first sight, it seems that $c000, $c002, $c004, $c005, $c007 are directly mapped to those registers. Here's the description for the Main Status Register. 0 - After reading the first byte in the result phase of the sense interrupt command from this drive. 1 - Diskette 0 is in seek mode, drive 0 busy. Set after the last byte of a seek or recalibrate commmand is written. 1 - Diskette 1 is in seek mode, drive 1 busy. Set after the last byte of a seek or recalibrate commmand is written. 1 - Diskette 2 is in seek mode, drive 2 busy. Set after the last byte of a seek or recalibrate commmand is written. 1 - Diskette 3 is in seek mode, drive 3 busy. Set after the last byte of a seek or recalibrate commmand is written. 0 - After the Last Byte of the Result Phase is Read. 1 - After the First Byte of the Command Phase is Written. 1 - Set during the execution phase of a command if it is in the non-DMA mode. If set, the multiple byte transfer must be monitored by the host either through interrupts or sofware polling. 0 - Data Transfer from Host to Controller. 1 - Data Transfer from Controller to Host. 1 - The MCS3201 is ready for the host to send or receive data. This bit clears after the transfer is complete and is set again when ready for the next transfer. So $f017 and $f00b wait for the device to be ready. 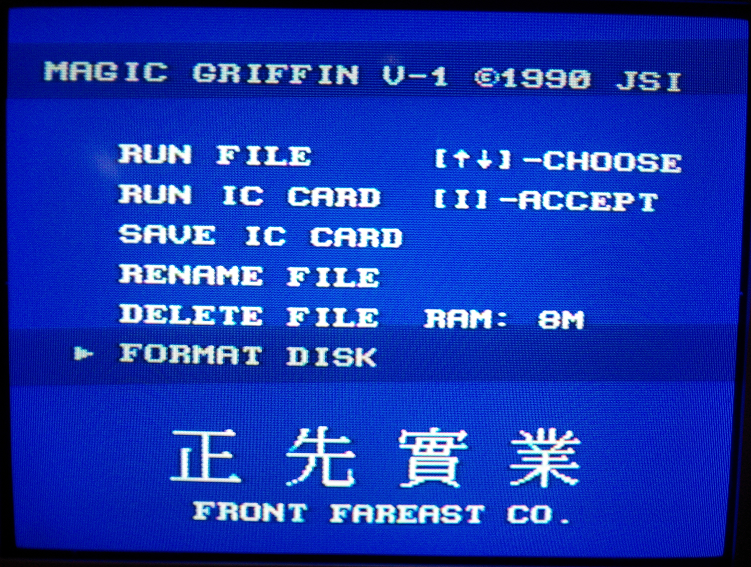 I just noticed that ucon64 supports the Magic Griffin COM interface.